Last chance holiday weekend. Just like all of the sales, the holidays will be soon departing. No more wrapping paper, candy, desserts, pies, enormous amounts of food, fun, laughs (and tears) anymore. Soon everyone will start cutting each other in line and lose their holiday spirit. So we suggest if you haven't done so already, that you grab the fam, head out and squeeze every last drop of the holiday season for 2012. Here are the limited time, classic and oh so fun holiday picks. We wish everyone a happy and healthy New Year too! The Rockefeller Center Christmas Tree is a world-wide symbol of the holidays in New York City. It's decorated with more than 30,000 multi-colored, energy-efficient LED lights, and crowned by a Swarovski star. The tree is at Rockefeller Plaza, between West 48th and West 51st Streets and 5th and 6th Avenues. Don't forget to lace up your skates and head down to the rink for classic holiday skating. The tree viewing is free and open daily. The rink is open 7:00AM until midnight. The cost for adults is $25, children under 11 and seniors are $15. Skate rental costs $10. 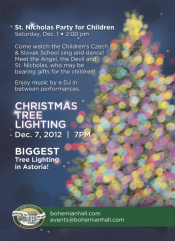 Come and enjoy one of New York City's favorite lit Christmas Trees at Citi Pond at Bryant Park. The ice skating rink is also the only free admission ice skating rink in the city. This magical ice skating rink is in its eighth season. Come take a whirl on the ice. If you don't have your own, skate rentals are $14. They also have a VIP FastPass on-site for $28 (online for $25) which includes VIP admission, skate rental, and bag check service is included in price. The Citi Pond is open 8:00AM until midnight Saturday and Sunday. This heart-warming musical is perfect for everyone's holiday season. Angelina and her friends are planning a holiday dance pageant. When a mix-up prevents the pageant from going on, Angelina and her friends must use their creativity to save the show. By working together they discover the true spirit of the holidays. It's not about things you receive, but the holiday cheer you share. The show takes place at the McGinn/Cazale Theatre on the Upper West Side on Saturday and Sunday at 11:00AM. Tickets cost between $29.50 - $49.50. The New York Botanical Garden transforms itself into a train wonderland for kids and adults alike. You can view the charming model trains, New York City landmark replicas, stroll the spectacular grounds, decorate (and eat!) gingersnaps, break for lunch and hot chocolate. Some of the landmarks constructed of natural materials such as bark, twigs, stems, fruits, seeds, and pine cones include the original Penn Station, Yankee Stadium, the Brooklyn Bridge and more. There are puppet shows and perhaps a visit from Thomas and some of his friends. The Holiday Train Show takes place on Saturday and Sunday through from 10:00AM to 7:00PM. All-Garden Pass tickets start at $20 for Adults and $10 for Kids 2-12. The animals at the Prospect Park Zoo get to join in the holiday fun by receiving presents too. Bring your family along to see the animals at 11:00AM and 3:30PM to watch as the Geoffrey Tamarins and North American River Otters tear into treat-filled bags and boxes. You can hold a personal family contest to see which are tamer opening gifts. The animals at the zoo, or the animals who live in your house! The present opening takes place on Saturday and Sunday at 11:00AM and 3:30PM. The present opening is free with zoo admission. Oh how this beloved classic has entered all of our hearts and minds during the holiday season. The Broadway musical takes it one step further and brings it to life before our very eyes. Speaking of eyes, You'll shoot your eye out kid! (sorry I had to). For those of you who are not fortunate to have watched this movie a gazillion times during the holiday season here's how the story goes. Ralphie Parker wants only one thing for Christmas: An Official Red Ryder Carbine-Action 200-shot Range Model Air Rifle. 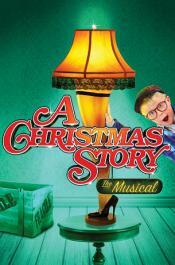 The Musical is the hilarious account of Ralphie's desperate quest to ensure that this most perfect of gifts ends up under his tree this Christmas. The show takes place at the Lunt-Fontanne Theatre in Midtown on Saturday at 2:00PM and 8:00PM and Sunday at 2:00PM. Tickets cost between $69 - $159. Magical holiday and family fun is still happening at the Al Hirshfeld Theatre in Midtown. You can see the hilarious tale of Buddy, a young orphan who mistakenly crawls into Santa’s bag of gifts and is transported to the North Pole. Buddy is raised unaware that he is actually a human, until his enormous size and poor toy-making abilities cause him to face the truth. With Santa’s permission, Buddy embarks on a journey to New York City to find his birth father and discover his true identity. Faced with the harsh reality that his father is on the naughty list and his step-brother doesn’t even believe in Santa, Buddy is determined to win over his new family and help New York remember the true meaning of Christmas. The show takes place on Saturday at 2:00PM and 8:00PM and Sunday at 2:00PM and 7:00PM. Tickets cost between $49 - $160. If you haven't seen all of the New York City major department stores holiday windows, this weekend is just about your last chance to do so. Take your family to see the spectacular Barney's windows. Barney's and Disney have teamed up to bring you a one-of-a-kind Electric Holiday Window Display. In the store there is also a "Minnie" theater where kids can sit comfortably and watch the window show and get a light up balloon. The windows are on view all day and night. They are free of charge to view. Perhaps you can take a stroll to see Bloomingdales, Bergdorf Goodman and the Saks Fifth Avenue store windows as well and make it a family window looking event. The Millennium Theatre in Brooklyn presents The Holiday Circus. It's back for its second year to wow, astonish and provide thrills for the whole family. Join the fun to experience a unique combination of classical circus entertainers and holiday joy. Featured performances by world famous jugglers, clowns, magicians, acrobats and animal acts from acclaimed circuses such as Big Apple Circus, Cirque Du Soleil, Ringling Bros and Barnum & Bailey, Circus and many more. The Holiday Circus takes place on Saturday and Sunday at 7:00 PM. Tickets cost between $35 - $55.